Colombia is one of the world’s best bird-watching destinations, containing more bird species — roughly 1,950 — than any other country on the planet. On top of that, 79 species are endemic to Colombia. Here is a list of the top 5 places to go birdwatching in Colombia. 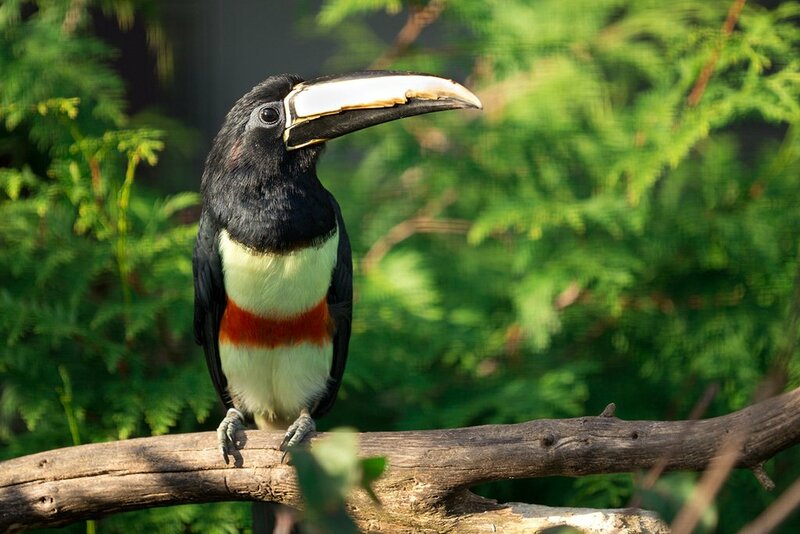 The best places to see birds in their natural habitat in Colombia are the Santa Marta’s mountains, Antioquia’s humid sub-tropical forests, the cloud forests that encircle Los Nevados, the lowland tropical rainforest of the Pacific Chocó Region, and the Amazon jungle. No matter where you go, the best time for bird watching is at first light, with that in Colombia being around the standard 6 am (given its equatorial location). For the best chance of seeing many birds in a short time, go to see them in such places as the Montezuma Lodge and road in the Western Andes / Chocó convergence point (in Tatama National Park), Río Blanco Nature Reserve (near Manizales), or Arrierito Antioqueño (Chestnut-capped Piha) Reserve and Rio Claro Nature Reserve (3 hrs from Medellin). To really experience each place and optimize your chance of identifying a bird, make sure to go with a local naturalist, biologist, or tour guide who works closely with local experts. Each area is home to specific species and it is overwhelming to learn — let alone access — these places without local knowledge. If you're looking for examples of great birding tours, check out our 16-day tour in the Andes & Magdalena Valley, and our birdwatching tour for 14 days in Western Andes & Santa Marta. 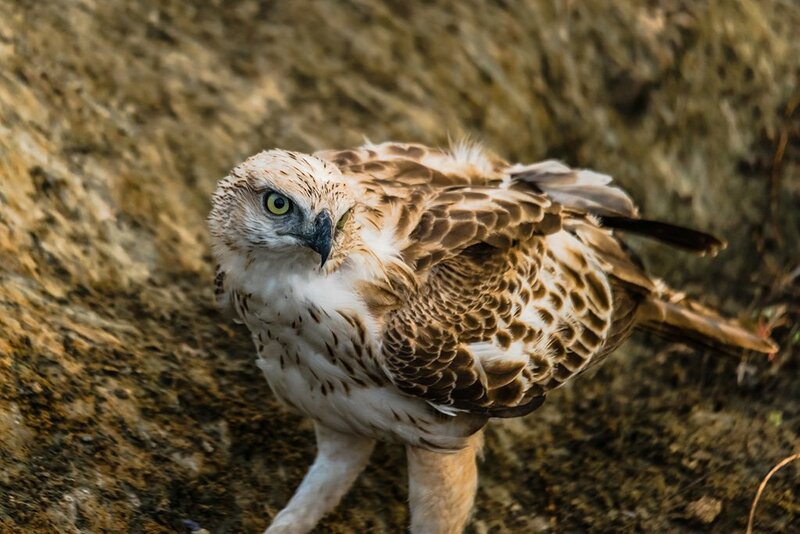 Santa Marta is Colombia’s premier destination for bird watching. Nearby bird populations are easily accessible from the protected areas of Tayrona National Park, Vía Parque Isla de Salamanca, as well as Minca and the San Lorenzo ridge in the Sierra Nevada de Santa Marta. This immense mountain range was recently named as the world's most irreplaceable concentration of biodiversity. 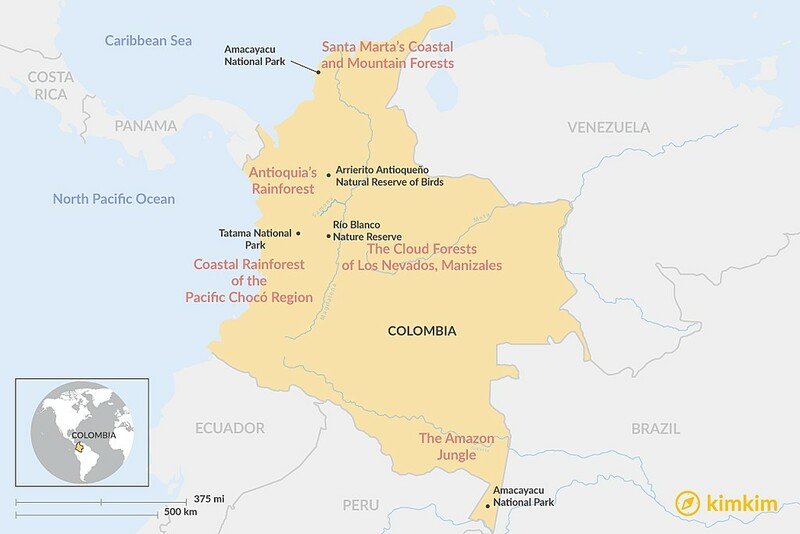 Everything here has evolved here, isolated some 200 million years ago from the main Andean chains of Colombia including the Santa Marta Parakeet, Santa Marta Screech-owl, Santa Marta Antpitta, Santa Marta Mountain-tanager, and Santa Marta Tapaculo. 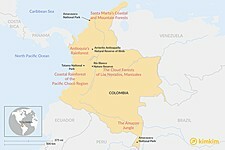 Twenty-two endemic species live in the sacred mountains of the Sierra Nevada de Santa Marta, home to Colombia’s tallest peaks and some of Colombia's most emblematic birds, including the Andean Condor (national bird), the threatened Black-and-Chestnut Eagle and Blue-billed Currasow, locally also known as the 'Paujil'. In the mountains, the ProAves El Dorado Bird Reserve and the San Lorenzo Ridge, because of its popularity, has many bilingual birding guides available who are experts on the site. These are contactable through local operators. On a budget, you can visit the foothills of the sierra in the town of Minca which also has some great birding. The Andean Region of Colombia hosts over 900 bird species. The department of Antioquia (of which Medellin is the capital) has river systems leading down to the Magdalena River Valley that create rainforest habitats with biodiversity only comparable to that found in the Amazon River rainforest. 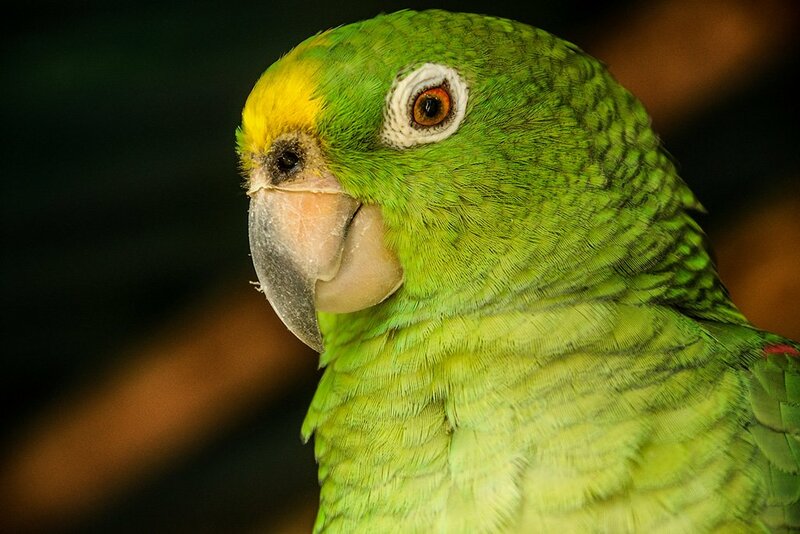 The Samana River, for example, is home to various species of parrot, toucan, tanager and other riparian birds that feed on endangered fish species, such as the bocachico. You can hire a local river specialist to take you down the Samana River, or you can take a public bus from Medellin to visit the Rio Claro Nature Reserve. Be sure to rise early in order to enjoy the most bird activity and have the highest chances of seeing the rarest birds, such as Magdalena Antbird and Sooty Ant-Tanager, and also to avoid the noises made by other tourists at Rio Claro. Farther north, visit the Arrierito Antioqueño Natural Reserve. The 1,324-hectare reserve is intended to protect the endangered Chestnut-capped Piha, an endemic bird of the region which gave its name to the reserve. In the region close to the reserve, there have been reports of birds such as Black Tinamou and Sharpbill. Other specialties include Stiles' Tapaculo, Parker's Antbird, Red-bellied Grackle, the stunning Multicoloured Tanager and Black and Gold Tanager, amongst many, many others. 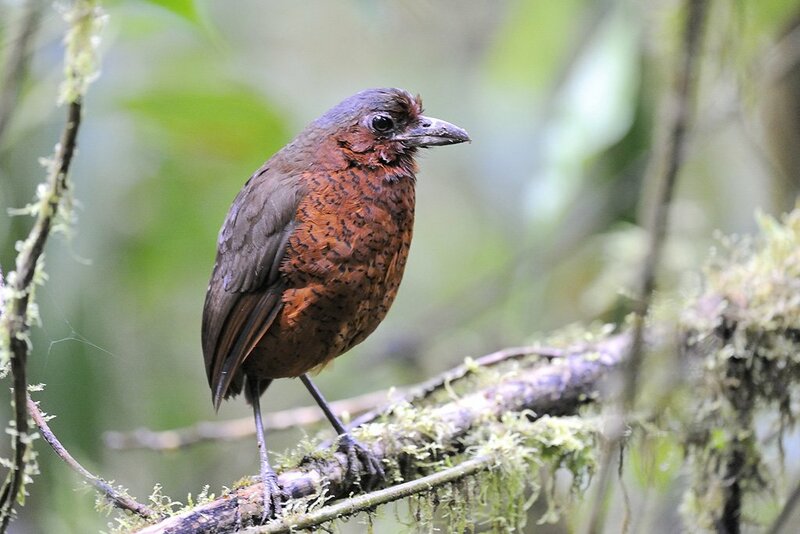 Twelve of Colombia’s endemic species are restricted to the Central Andean chain of Colombia or Central Andes, including Brown-Banded Antpitta and Rufous-fronted Parakeet. Within a 30 min. drive from the city of Manizales, you can see these species and more on 4,343 hectares of nature trails in the cloud forests at the Río Blanco Nature Reserve, considered to be among the top 3 places in the world for birding and renowned for the various species of Antpitta that can be seen, a normally skulking genus of bird which makes viewing very difficult. Join a guide to lookout for high-altitude specialties in the nearby top trekking destination of Los Nevados National Natural Park. Noteworthy birds include the endemic Buffy Helmetcrest hummingbird and Colombia’s national bird: the Andean condor. The Andean condor is the heaviest flying bird in the world and it can fly up to three hundred kilometers in a single day. Also occurring near Los Nevados, high up in a large patch of high-Andean forest, you can look for possibly Colombia's rarest bird - the critically endangered and endemic Fuertes's Parrot, the also endemic, vulnerable and simply beautiful Rufous-fronted Parakeet, and the stunning Rainbow-bearded Thornbill. Around 650 bird species inhabit this biodiverse region on Colombia’s Pacific Coast. Among the best places to visit this coast include the beautiful Bahia Solano, a surf town by the Utria National Park. In Bahia Solano, there are many beautiful lodges from where you can see birds, but you need to fly into this secluded oasis as there is no road access. Both places require you to take a guide into the parks. Endemics that occur here include such birds as the Baudó Oropendola, Baudó Guan, and Sooty-capped Puffbird — all are highly sought after species found in the Choco lowlands. Other noteworthy species include the Harpy Eagle, Tawny-faced Quail, Brown Wood-Rail, Choco Tinamou and Crested Eagle. The Amazon is indisputably Colombia’s true bird watching paradise. With over 750 bird species in the Colombian Amazon, one-third of the country’s overall bird population lives here. The various indigenous communities that neighbor the famous Amacayacu National Park are a good place to spend the night and awake early for a chance to look for the 470 species of birds found in the park, including the sought after Amazonian Umbrellabird and striking Hoatzin. Various river islands that are in constant change, lying in the middle of the great river itself, also provide great birds, such as Osprey, Bat Falcon, Great Black Hawk, Cream-coloured Woodpecker among endless species of parrot. Puerto Nariño is also an ideal location in the Amazon for a chance to see flocks of more than twenty species of parrots. Parakeets, macaws, antbirds, and woodpeckers can be seen on the banks of the Amazon River. Colombia’s migratory species come and go based on the specific regions, but you are sure to see the majority of Colombia’s birds at any time of the year. Climate is fairly consistent year round and should not be a limiting factor for any region, yet expect rain in the Amazon and the Choco Pacific rainforest regions. Care should be taken to try and avoid Colombia's two rainy seasons: April to May and October to November. This applies to the Andes, mainly, though you should always check rainfall charts of the place that you're going to visit to ensure that you get an accurate picture. 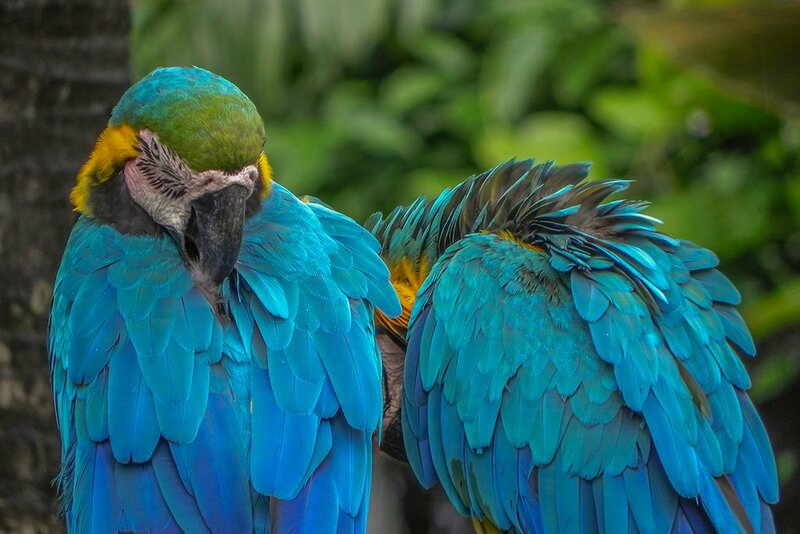 Perhaps not for everyone given it's a man-made enclave, you can see birds year-round in a dry climate by visiting the Aviario National Park, the largest aviary in the Americas. Located 14.5 km from Cartagena, it holds around 138 bird species and 1,800 genetic copies. Walking on nature trails through the jungle and beach, you can see a fleet of pink flamingo, tropical birds, and birds of prey in three different ecosystems (rainforest, coast, and desert). Birds of note include the Harpy Eagle, the toucan Caribbean, Crane Corona. To avoid crowds, avoid traveling in the high tourist season during Easter week holiday and December to January. Special thanks to Tara Davis and Juan Ortiz for the local insights provided in this article. We had a busy visit to Colombia and just time for a day's birding from Medellin. We were put in touch with Juan Ortiz who was great. He made some great suggestions but told us frankly what was going to work with our flights, and what no. In the end we went birding in two parks above Medellin with Ivan Lau. It was a great day, we saw 50 different species of bird and Ivan was incredibly knowledgeable and patient. What especially impressed me is that Juan and Ivan offered us more experiences than we had the time or energy for, all including in the price. They are real enthusiasts. And I learned a lot about the culture and history of Venezuela and Colombia during the day.